Hey, there. Taking a little break from my job as a lineman with the electric company here in Brown County, Indiana to greet all you folks. Robbie's too busy over at Pans 'N Pancakes right now to write. Since I got a real warm spot in my heart for that woman, I told her I'd fill in. We've been a number for a few months now, ever since that, uh, jerk of a Jim dropped her like she was a burnt-up sausage. A man shouldn't treat his woman like that, don't you agree? I 'm much too enamored of her can-do spirit, her gorgeous smile, and her super-smart brain to ever want to leave her, frankly. Not that I've popped the question or anything. We're taking it slow, enjoying each other's company, getting to know one another. I'm not all that comfortable with her trying to solve crimes, though, mostly because it's darn dangerous. But hey, if she's involved, I'm involved and that's all there is to it. And this winter, who-ee, did we get entangled in one. I ain't revealing any secrets about the story when I tell you that ice storms are serious business, and you sure as heck don't want to get caught in one with a cold-blooded killer. Ms. Day, the author, is over there waving her hand, reminding me to tell you the book comes out March 28. It won't be long now until you can read all about it yourself. And just for the fun of it, she's giving away an advance review copy of the book to one commenter before dawn tomorrow in Indiana! So make sure she can find you by email, allrighty? Okay, then, catch ya later. Edith Maxwell writes the Quaker Midwife Mysteries (with Delivering the Truth nominated for an Agatha Award for Best Historical Mystery) and the Local Foods Mysteries; the Country Store Mysteries and the Cozy Capers Bookd Group Mysteries (as Maddie Day); and award-winning, Agatha-nominated short crime fiction. Maxwell is President of Sisters in Crime New England. She lives north of Boston with her beau and three cats, and blogs here, with the other Wicked Cozy Authors, and with the Midnight Ink Writers. You can find her on Facebook, twitter, Pinterest, and at her web site, edithmaxwell.com. I love this series and can't wait to read this! This sounds great and I would love to read it. Please enter me. Love Love Love the cover! Great to hear more of Abe's voice, can't wait for the new one! Thanks for the chance to win! Love the cover,can't wait to read it. Not participating in giveway but can't wait for my personal copy to arrive. I loved it, loved it, loved it. 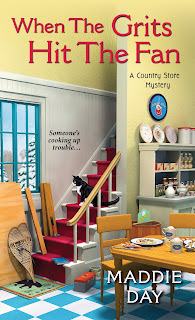 I adore traditional cozy mysteries but love them best with they have their own style and that is so true of this series. While Robbie does fall into things sometimes, it is not because she isn't thinking; she is a bit of magnet for trouble. She is also hard working, kind and intelligent. Abe is a hunk and I am so glad they got together. Love the cover. Thanks for the chance. Love this series and can't wait to read!! Love the cover and the title! I would be very interested in getting more books read in Edith's various series. Thank you for that opportunity. I love that series! Thanks for the chance to win! This book looks like so much fun. The cover is awesome and yes, solving crimes is dangerous! Can't wait to read. If Robbie gets tired of Abe, you can send him to California :-) Looking forward to an engaging and engrossing read! Sounds like the start of another wonderful story line. Great cover and adorable title!! Very cool cover, would love to read this series. Love the title and cover of the book. I love this series. I can't wait for this book! This series is on my TBR. Thanks for the opportunity. You are the winner, Kathleen! Please send your snail mail address to me at edith at edithmaxwell dot com. can't wait to read..looks great.. 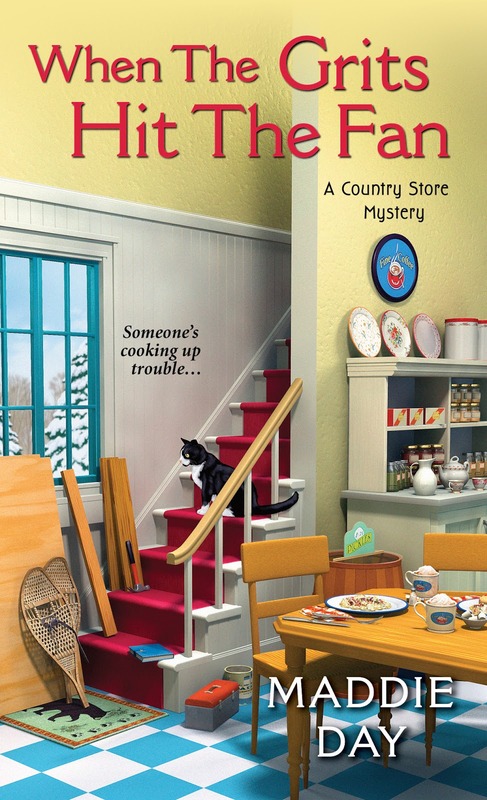 I love the Quaker Midwife Mystery series, and this one...Country Store, Yeah! I haven't read this series yet, but I really enjoyed the synopsis of the book. Cant wait to read "When the Grits Hit the Fan". I love the cover on this book - and it sounds amazing! Can't wait to read WHEN THE GRITS HITS THE FAN! This sounds like a book I would love to read, thanks for the giveaway! That country twang reminds me of home. I'm not familiar with the series, but it sounds like one I could get into.